The late political commentator Charles Krauthammer became known to most Americans and the world by his nightly appearances on Fox News. He dominated discussions on whatever show he appeared through the sheer force of his tremendous intellect and the calm, logical manner in which he analyzed current events. But Krauthammer’s true forte was the written word—in his columns for The New Republic, Time, and The Washington Post, many of which are compiled by his son Daniel in The Point of It All. Every Krauthammer column is a joy to read—whether you agree or disagree with his particular position on a specific political issue or personality—because he combined graceful writing, compelling logic, brilliant argument, and well-reasoned and thought-provoking analysis. Krauthammer began his professional career in medicine—as a psychiatrist. He suffered a crippling injury while in medical school that confined him to a wheelchair for the rest of his life. He worked as a psychiatrist in Massachusetts for seven years before moving to Washington, D.C., to write about America and the world. He began writing as a philosophical and political liberal in the late 1970s, including writing speeches for Vice President Walter Mondale. At The New Republic, Krauthammer wrote as a liberal anti-communist, pro-Israel hawk. His political positions were similar to those of Democratic Senator Henry M. “Scoop” Jackson, a leading defense expert and critic of arms control and détente with the Soviet Union. As evidenced by the columns in this book, Krauthammer, like many eminent writers before him—James Burnham, Whittaker Chambers, Irving Kristol, Norman Podhoretz, and David Horowitz, to name only a few—traveled the intellectual odyssey from liberalism to conservatism. When Krauthammer died earlier this year, he was probably the most influential conservative commentator in America due to his Fox News commentaries. President George W. Bush, Krauthammer wrote, also sought to liberate and bring democracy to Afghanistan and the Arab nations of the Middle East, but Afghanistan “turned out to be a land too primitive to democratize, too fractured to unify,” while the hard won success in Iraq, he contends, was frittered away by the Obama administration. In the end, Bush’s greatest legacy, Krauthammer wrote, was that after 9/11 he kept us safe, and “he created the entire anti-terror infrastructure that continues to keep us safe.” He likened the immediate assessment of Bush to that of Harry Truman. Both left office scorned and unpopular because of inconclusive wars, but with the passage of time history rated Truman better and it will likely treat Bush in similar fashion, Krauthammer believes. His praise for Reagan, John Paul II, Bush, and other conservative world leaders was matched by his criticism of President Obama and the liberal worldview. He blamed Obama for the U.S. retreat from the Middle East and the return of Russian influence in the region. Russia, he wrote in a Washington Post column in 2014, “has run rings around America” under President Obama. When Obama reacted to Russia’s aggression in Ukraine by lamenting at the UN that “No one nation can or should try to dominate another nation,” Krauthammer wrote: “That’s the kind of sentiment you expect from a Miss America contestant asked to name her fondest wish, not from the leader of the free world explaining his foreign policy.” There is much more like this in the book. Krauthammer also had few kind words for President Trump. Even as he decried what he called Trump Derangement Syndrome on the left, he wrote that Trump has undermined NATO and U.S. extended deterrence, foolishly proclaimed the slogan of “America First,” abruptly and wrongly turned away from free trade, and unwisely extended U.S. support to authoritarian rulers around the world. It is when Krauthammer wrote about some of the social issues, however, that his ambivalence with conservatism was evident. For example, he wrote that Roe v. Wade was wrongly decided and denounced late-term abortions, but still supported abortion rights. He defended those on the right who believe in the sanctity of traditional marriage, but he nevertheless supported gay marriage. In several columns he refused to accept that the science is “settled” on the causes of climate change, yet he urged the United States to unilaterally burn fewer fossil fuels. He criticized the liberal approach to affirmative action, but sided with Justice Stephen Breyer’s notion that the Constitution permits race-conscious discrimination. On the other hand, Krauthammer is scathing in his denunciation of America’s “thoroughly secularized culture” that treats religious believers—especially Christians—as uneducated and unsophisticated. He paraphrases G. K. Chesterton: “Tolerance is not just the virtue of people who do not believe in anything; tolerance extends only to people who don’t believe in anything.” In one column, Krauthammer, a Jew, celebrates Christians and Christmas. There is much more here, including Krauthammer’s observations on fatherhood, baseball, golf, chess, sailing, space travel, the medical profession, movies, and a loving tribute to his wife. 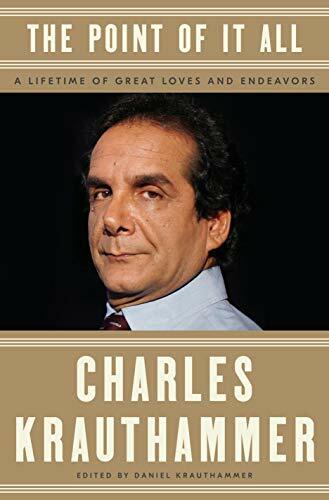 Daniel Krauthammer, who writes a splendid introduction and moving eulogy of his father, notes that Charles Krauthammer intended to write a book on foreign policy. The longest essay in The Point of It All, Daniel writes, would have formed the core of that work. Written in July 2017, it exhibits a very pessimistic worldview in which Krauthammer sensed a worldwide shift towards authoritarianism, not just in Russia and China, but also in Western Europe and the United States. It is almost Spenglerian in its pessimism about the West. One can only hope that in this instance, unlike most others, Krauthammer’s gifts of observation and analysis failed him.